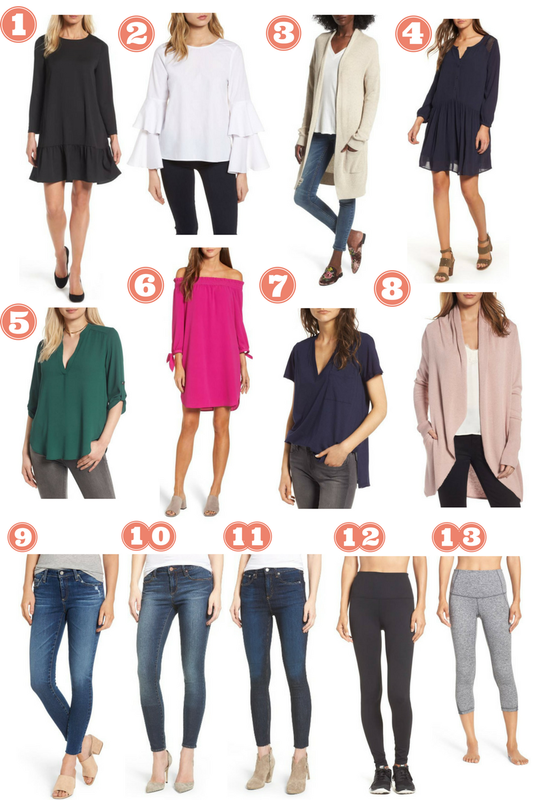 The day has officially arrived, it's blogger Christmas in July, otherwise known as the Nordstrom Anniversary Sale! I know that everyone and their mother is blowing up this sale so I promise to keep my posts to a minimum but as much as you want to hate, this sale is just too good to pass up! I've personally been shopping this sale since before it was online and you had to arrive in store at 7am to get the good stuff! 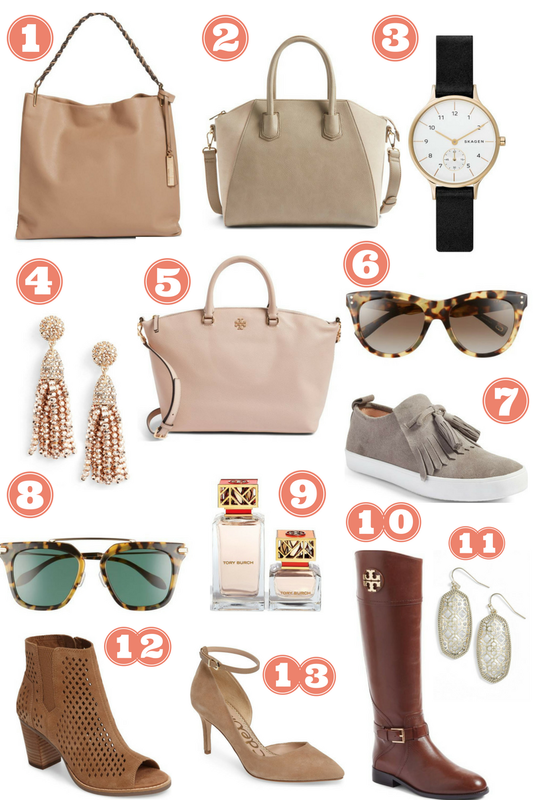 Today I'm rounding up my favorites from the sale starting with clothes and then below I did accessories and shoes. I did make a small purchase this morning but I think I have a few more items I might need to add to my cart! 2) Chelsea 28 Bell Sleeve Poplin Top - I looooooove this one. For some reason I am obsessed with white this year and this bell sleeve look. While this is so impractical for my life right now I do think it would be fun for girls night out. 3)BP Lightweight Rib stitch Cardigan - In my opinion you can never have too many long oversized cardigans to wear with leggings in the fall and winter. 6) Vince Camuto Stretch Crepe Shift Dress- off the shoulder and pink, how can anyone say no to that?! 7) Lush Raw Edge Side Split Tee- I ordered this one and I'm excited to see how it fits. I think it's perfect for wearing now or layering under cardigans in the fall. 9) AG Legging Raw Hem Jeans- I own these jeans and they're amazing!! A very flattering fit and so comfortable. 10) Articles of Society Mya Jean- Another pair of jeans I own, but I plan to pick up a second pair. These are hands down the best jeans under $100, but with the sale they're only $38! I get so many compliments every time I wear them. 11) Rag & Bone Raw Hem High Waisted Jeans- I love my Rag and Bone the skinny jeans I've had forever, but they're about to rip a hole in the knee, so I'm thinking of adding these to my fall collection. 12) Zella High Waist Live in Legging- THE BEST LEGGINGS EVER. IF YOU DON'T OWN THEM, BUY THEM NOW. 2) Sole Society Mikayla Faux Leather Suede Tote- SS does such a good job of having really affordable good looking bags. I like that they look expensive and designer but you don't have to break the bank for them. 4) Baublebar Mini Metallic Piñata Earrings- one of my favorite earring styles in a fun fall metallic style! 5) Tory Burch Frida Leather Satchel- Every year I eye these bags but every year I pass over it because I just can't justify the price but I love this blush color and the fact that it's cross body. Which is my favorite style these days. 7) Kate Spade Lenna Tassel Sneaker- I need these sneaks to pair with my oversized cardigans and legging this fall. How adorable are the tassels? 10) Tory Burch Adeline Boot- these are a must on my list this year!! I pass them by every year but I'm officially bootless right now so I had to snag these before they sold out. 13) Sam Edelman Tia Ankle Strap Heels- love, love, love these heels and think they would be a great addition to my fall/winter heel collection. Did you shop the sale yet, or waiting for public access? What are our favorites? That button front dress is gorgeous, I would LOVE that with boots for the fall! I will take one of everything please! Actually, I may have bought one of everything, oops! That pink off the shoulder dress will look SO amazing on you! !